Has decision been made on the owner/operator of the water systems for two Oakland Township areas? 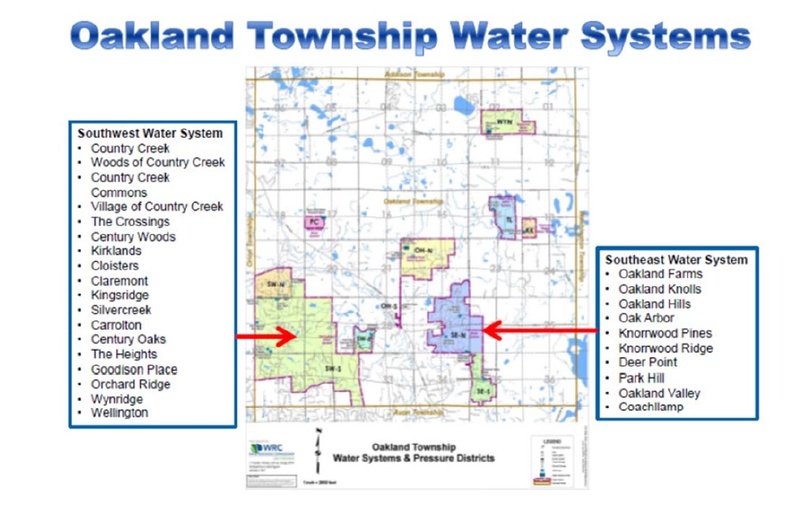 At the May 26, 2015 BOT meeting, the Board’s discussion alluded to the fact that the Board was still looking at several options on who will manage the water supply systems for two areas of Oakland Township. Here is a link to the discussions at that meeting. Trustee Giannangeli indicated there were several options that the Township was considering. Why is this important to the citizens of Oakland Township? In less than a month, it appears the Township Board has moved from having several options under consideration to having selected the Oakland County Water Resource Commission as the source for managing and maintaining the water supply systems for two areas in our Township. This apparent decision appears to have been made outside any public meeting, and without a discussion of the advantages and disadvantages for all the options that were under consideration less than a month ago. Where and when did that discussion and decision occur in a public meeting? This entry was posted in A new kind of "Transparency", Board of Trustees and tagged Board of Trustees, Jeanne Langlois, oakland township, Oakland Township and OC WRC, Oakland Township Board, Transparency on June 28, 2015 by richardjmichalski. As previously reported, a discussion about Oil and Gas drilling in Oakland Township is on the June 23, 2015 Oakland Township Board meeting. Assuming the Board will allow comments from citizens on this subject, we anticipate spokespersons from the Rochester Hills Don’t Drill the Hills group, and the Shelby Citizens Against Residential Drilling group (CARD) will provide specific suggestions to our Board based on their communities’ recent experiences. If you want to learn more about this issue in Oakland Township, and/or have some opinions on it, please come to the June 23rd meeting. Oakland Township Citizen involvement is important on this critical issue. This entry was posted in Legal Problems, Planning and Zoning and tagged oakland township, Oakland Township Board, Oil and Gas drilling in Oakland Township on June 21, 2015 by richardjmichalski. 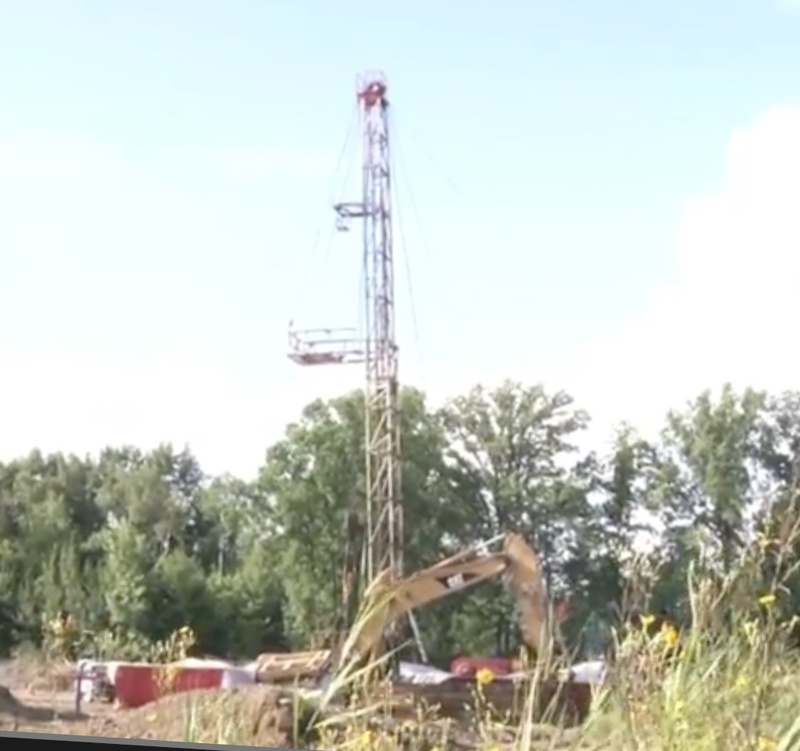 There are several new developments regarding the potential drilling for oil and gas in Oakland Township. As previously reported, one property owner signed a lease agreement with West Bay Exploration Company. The property involved in that agreement is 3700 Dutton Road. It was discovered that West Bay Exploration Company also recorded another agreement on May 11, 2015. This lease agreement is with the Oakland Christian Church located at the southwest corner of Silverbell and Adams Road. 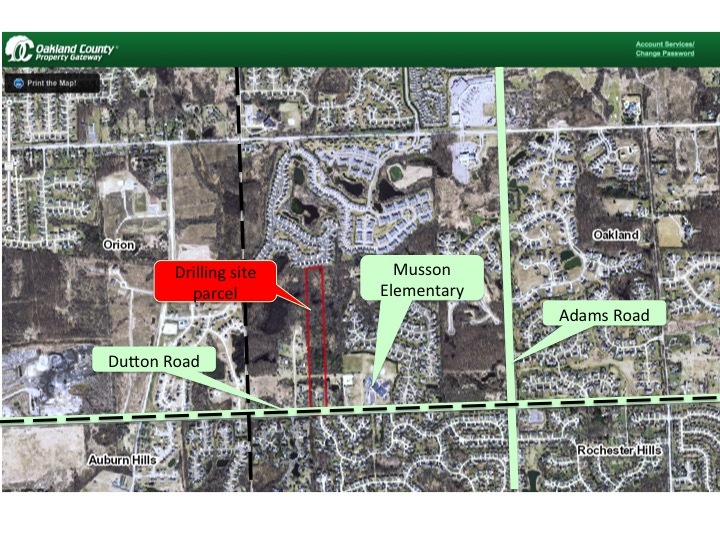 At the June 15, 2015 Rochester Hill City Council meeting, there were approximately 12 Rochester Hills citizens that expressed concerns over the possible drilling at the Dutton Road location, which is near Musson Elementary School in our Township. In anticipation of the outpouring of citizen concerns for drilling at that location, Mayor Barnett contacted West Bay Exploration Company earlier that day to understand their drilling intentions. Mayor Barnett indicated that West Bay said there was “no interest in doing anything at that site” and “they are planning to ‘pull’ all of (their) Northern Oakland County activities”. Barnett asked that they document that intention in writing. Mayor Barnett later explained the history behind the volatile issue of drilling in Rochester Hills. He stated Rochester Hills has taken very aggressive steps to protect the citizens from drilling in Rochester Hills through their recent ordinance changes. He indicated that their ordinances may be challenged in court. He went on to explain the delicate balance between the rights of property owners vs. protecting the larger community against indiscriminate drilling in the community. He feels Rochester Hills has done everything they can do, but have no control over what happens in Oakland Township. Why is this important to the citizens of Oakland Township? West Bay Exploration Company’s stated intentions may give Oakland Township an opportunity to ‘shore up’ our ordinances to the fullest extent allowed by law to protect our community from indiscriminate drilling. Mr. Barnett indicated that the smaller communities, like Oakland Township, have fewer things they can do to protect their communities. We trust that the Board will work with our Attorney, the Township Planner and our neighboring communities to come up with ordinance changes that maximize our control over these facilities. We may have bought some time as a result of West Bay’s current position, but there are other oil drilling companies that may not have made the same decision. Also, when the price of oil goes up, it may be financially advantageous for the oil drilling company to ‘renege’ on their stated current position. It is hard to understand why West Bay would record their lease agreements with the County and only one month later, indicate that they have no intention of exercising them. Let’s make sure Oakland Township takes advantage of West Bay’s stated decision by officially making a motion to place a short moratorium on drilling in Oakland Township, much like Rochester Hills and Shelby did, so we have time to work on our ordinances. The balance between individual property rights and the welfare of the community is one that may pit neighbor against neighbor. The Board must look at all the options and proactively deal with this issue before the oil drilling companies start operations near sensitive areas in our Township. The current plan for linking the community water wells for many of the subdivisions in the Southwest portion of the Township could factor into what the Township does on drilling for oil and gas. This entry was posted in Legal Problems, Planning and Zoning and tagged oakland township, Oil and Gas drilling in Oakland Township, Planning and Zoning in Oakland Township on June 17, 2015 by richardjmichalski. Some of you may be aware of the struggles that our neighboring communities have had with Oil and Gas drilling activities. Shelby Twp. and Rochester Hills are two of our closest neighbors that have been involved in that fight. A recent filing by West Bay Explorations now may place Oakland Township in the fray. What follows is a link to the Don’t Drill the Hills (DDH) website that indicates that the property owner of 3700 Dutton Road made an agreement with West Bay Explorations on July 23, 2012. The company has now filed the signed oil & gas lease agreement with the County allowing the company the right to put a well on that property. This parcel is near Musson Elementary School in Oakland Township. The residents of Oakland Township have not been involved in any discussions with the Township Board on this issue. The Board is finally considering changes to our Zoning Ordinance (Ordinance 16). The citizens need to ensure that our leadership adequately protects us from undesirable wells in our community. Don’t Drill The Hills has been actively watching for records filed with the county involving oil and gas leases. 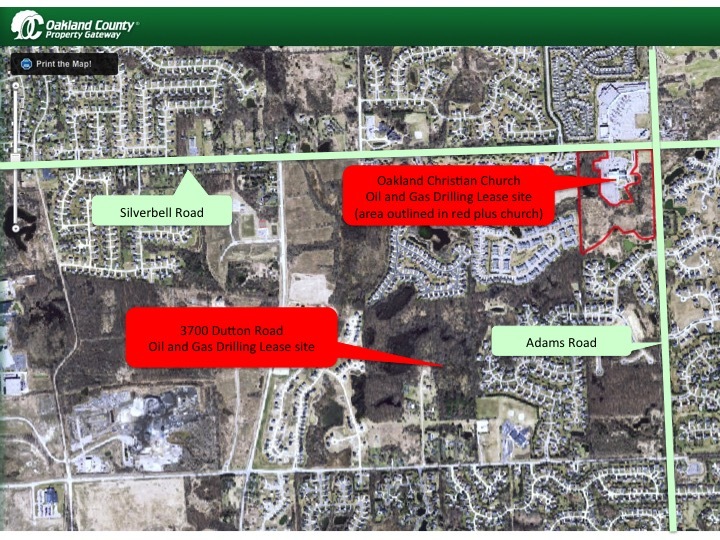 On May 11, 2015 West Bay Exploration filed with Oakland County an oil and gas lease which allows surface activities including drilling rigs, pipelines, access roads, and storage tanks on 18.82 acres at 3700 Dutton Rd, adjacent to Musson Elementary school. With a wellhead at this location West Bay can horizontally drill, using an “acid matrix stimulation” method up to two miles away. If you are concerned about industrial activities being permitted in residential areas, you need to ACT NOW! DDH started warning residents over one year ago about the possibility of drilling activities in the area discussed today. Contact your local officials, the DEQ, and your state legislature telling them you don’t support drilling near our schools and neighborhoods. The drilling has not yet started. The time to voice your concern is now… before the wells go in! The citizens of Oakland Township must demand that our Township Board protect our community from inappropriate drilling sites. As they make changes to Ordinance 16, they must include wording that protects us to the fullest extent of the law. A drilling site is capable of horizontally drilling under large acreage parcels, as well as homes and schools, to get to where they have obtained oil and gas access rights. Why is this important to the citizens of Oakland Township? Oakland Township has certainly had our share of issues since the new Board was elected in 2012. The drilling issue may now be heating up to the point where citizen involvement is not only important, but essential to prevent the type of issues Rochester Hills and Shelby have had. Proper legal wording in our Ordinances may plug some of the loopholes that have recently been created by our State Legislature on this matter. I suggest that our Board set up a separate public meeting to discuss just this issue. They should invite representatives from the Shelby Citizens Against Residential Drilling (CARD), and the Rochester Hills Don’t Drill the Hills group (DDH) to educate interested Oakland Township citizens, and Board and Parks Commission members on this subject. The Board should also send letters to all Home Owner Associations informing them of the proposed meeting. Fortunately, the Shelby CARD group is willing and able to aid our Township in establishing a group of informed and concerned citizens to help protect our Township using their many ‘lessons learned’. Since they are a Township, they are familiar with the unique regulations controlling what Township’s can do as compared to cities. We need to take advantage of their expertise and not ‘reinvent the wheel’. Our community needs to ‘get out in front’ of this issue. We also need to support our surrounding communities in their fight over this issue. This entry was posted in Legal Problems, Planning and Zoning and tagged oakland township, Oil and Gas drilling in Oakland Township, Planning and Zoning in Oakland Township on June 13, 2015 by richardjmichalski.